Location of Greater Lebanon (green) within the Mandate of Syria and Lebanon. The State of Greater Lebanon (Arabic: دولة لبنان الكبير‎ Dawlat Lubnān al-Kabīr; French: État du Grand Liban) was a state declared on 1 September 1920, which became the Lebanese Republic (French: République libanaise) in May 1926, and is the predecessor of modern Lebanon. 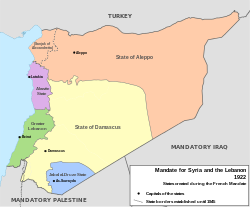 The state was declared on 1 September 1920, following Decree 318 of 31 August 1920, as a League of Nations Mandate under the proposed terms of the French Mandate for Syria and Lebanon which was to be ratified in 1923. When the Ottoman Empire was formally split up by the Treaty of Sèvres in 1920, it was decided that four of its territories in the Middle East should be League of Nations mandates temporarily governed by the United Kingdom and France on behalf of the League. The British were given Palestine and Iraq, while the French were given a mandate over Syria and Lebanon. General Gouraud proclaimed the establishment of the state with its present boundaries after splitting few Syrian villages on the southern and western borders with Lebanon and adding them to Lebanon and with Beirut as its capital. The new territory was granted a flag, merging the French flag with the Lebanese cedar. Map of Greater Lebanon's borders compared with the border of the previous territory of the Mount Lebanon Mutasarrifate (black dashed line), overlaid on a map of modern-day religious groups distribution. The term Greater Lebanon alludes to the almost doubling of the size of the Mount Lebanon Mutasarrifate, the existing former autonomous region, as a result of the incorporation of the former Ottoman districts of Tripoli and Sidon as well as the Bekaa Valley. The Mutasarrifate had been established in 1861 to protect the local Christian population by the European powers under the terms of the Règlement Organique. The term, in French "Le Grand Liban", was first used by the Lebanese intellectuals Bulus Nujaym and Albert Naccache, during the buildup to the 1919 Paris Peace Conference. Nujaym was building on his widely read 1908 work La question du Liban, a 550-page analysis which was to become the foundation for arguments in favor of a Greater Lebanon. The work argued that a significant extension of Lebanon's boundaries was required for economic success. The boundaries suggested by Nujaym as representing the "Liban de la grande époque" were drawn from the map of the 1860-64 French expedition, which has been cited as an example of a modern map having "predicted the nation instead of just recording it". On October 27, 1919, the Lebanese delegation led by Maronite Patriarch Elias Peter Hoayek presented the Lebanese aspirations in a memorandum to the Paris Peace Conference. This included a significant extension of the frontiers of the Lebanon Mutasarrifate, arguing that the additional areas constituted natural parts of Lebanon, despite the fact that the Christian community would not be a clear majority in such an enlarged state. The quest for the annexation of agricultural lands in the Bekaa and Akkar was fueled by existential fears following the death of nearly half of the Mount Lebanon Mutasarrifate population in the Great Famine; the Maronite church and the secular leaders sought a state that could better provide for its people. The areas to be added to the Mutasarrifate included the coastal towns of Beirut, Tripoli, Sidon and Tyre and their respective hinterlands, all of which belonged to the Beirut Vilayet, together with four Kazas of the Syria Vilayet (Baalbek, the Bekaa, Rashaya and Hasbaya). Arrete no 318 creating "l'Etat du Grand Liban"
Following the peace conference, the French were awarded the French Mandate for Syria and the Lebanon, under which the definition of Lebanon was still to be set by the French. Most of the territory was controlled the Occupied Enemy Territory Administration, with the remainder controlled for a short time by the Arab Kingdom of Syria until the latter's defeat in July 1920. Following the decisive Battle of Maysalun, Lebanese Maronites openly celebrated the Arab defeat. On August 24, 1920, French Prime Minister Alexandre Millerand wrote to Archbishop Khoury: "Your country's claims on the Bekaa, that you have recalled for me, have been granted. On instructions from the French government, General Gouraud has proclaimed at Zahle's Grand Kadri Hotel, the incorporation into Lebanon of the territory that extends up to the summit of the Anti-Lebanon range and of Hermon. This is the Greater Lebanon that France wishes to form to assure your country of its natural borders." Lebanon gained its independence in 1943 and the French left the country in 1946. The first Lebanese constitution was promulgated on May 23, 1926, and subsequently amended several times. Modeled after that of the French Third Republic, it provided for a bicameral parliament with Chamber of Deputies and a Senate (although the latter was eventually dropped), a President, and a Council of Ministers, or cabinet. The president was to be elected by the Chamber of Deputies for one six-year term and could not be reelected until a six-year period had elapsed; deputies were to be popularly elected along confessional lines. The first Lebanese flag, hand-drawn and signed by the deputies of the Lebanese parliament, 11 November 1943. A custom of selecting major political officers, as well as top ranks within the public administration, according to the proportion of the principal sects in the population was strengthened during this period. Thus, for example, the president ought to be a Maronite Christian, the prime minister a Sunni Muslim, and the speaker of the Chamber of Deputies a Shia Muslim. A Greek Orthodox and a Druze would always be present in the cabinet. This practice increased sectarian tension by providing excessive power to the Maronite president (such as the ability to choose the prime minister), and hindered the formation of a Lebanese national identity. Theoretically, the Chamber of Deputies performed the legislative function, but in fact bills were prepared by the executive and submitted to the Chamber of Deputies, which passed them virtually without exception. Under the Constitution, the French high commissioner still exercised supreme power, an arrangement that initially brought objections from the Lebanese nationalists. Nevertheless, Charles Debbas, a Greek Orthodox, was elected the first president of Lebanon three days after the adoption of the Constitution. At the end of Debbas's first term in 1932, Bishara al-Khuri and Émile Eddé competed for the office of president, thus dividing the Chamber of Deputies. To break the deadlock, some deputies suggested Shaykh Muhammad al Jisr, who was chairman of the Council of Ministers and the Muslim leader of Tripoli, as a compromise candidate. However, French high commissioner Henri Ponsot suspended the constitution on May 9, 1932, and extended the term of Debbas for one year; in this way he prevented the election of a Muslim as president. Dissatisfied with Ponsot's conduct, the French authorities replaced him with Comte Damien de Martel, who, on January 30, 1934, appointed Habib Pacha Es-Saad as president for a one-year term (later extended for an additional year). Émile Eddé was elected president on January 30, 1936. A year later, he partially reestablished the Constitution of 1926 and proceeded to hold elections for the Chamber of Deputies. However, the Constitution was again suspended by the French high commissioner in September 1939, at the outbreak of World War II. 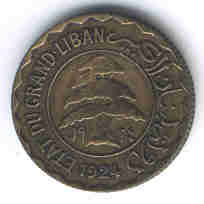 A Greater Lebanon five-piastre coin, 1924. The French mandate promoted French culture and the French language in education. English was also common in higher education. Foreign mission schools were the main institutions for education, providing higher standards of education than under Ottoman administration, with no state-run system. ^ Emmanuel Brunet-Jailly (28 July 2015). Border Disputes: A Global Encyclopedia [3 volumes]: A Global Encyclopedia. ABC-CLIO. pp. 353–. ISBN 978-1-61069-024-9. ^ a b Meir Zamir (1988). The formation of modern Lebanon. Cornell University Press. pp. 15–16. ISBN 978-0-8014-9523-6. Nujaym’s formulation was to become the basis for Lebanese Christian arguments in favor of a Greater Lebanon. It stressed the national rather than economic aspects of that goal. Only extended boundaries would enable Lebanon to exist as an independent state. Nujaym told the European public that the Lebanese question required a definite solution: the establishment of an independent Christian state. ^ Tetz Rooke (2013). "Writing the Boundary: "Khitat al-Shăm" by Muhammad Kurd ʹAli". In Hiroyuki. Concept Of Territory In Islamic Thought. Routledge. p. 178. ISBN 978-1-136-18453-6. His [(Thongchai Winichakul’s)] study shows that the modern map in some cases predicted the nation instead of just recording it; rather than describing existing borders it created the reality it was assumed to depict. The power of the map over the mind was great:"[H]ow could a nation resist being found if a nineteenth century map had predicted it?" In the Middle East, Lebanon seems to offer a corresponding example. When the idea of a Greater Lebanon in 1908 was put forward in a book by Bulus Nujaym, a Lebanese Maronite writing under the pseudonym of M. Jouplain, he suggested that the natural boundaries of Lebanon were exactly the same as drawn in the 1861 and 1863 staff maps of the French military expedition to Syria, maps that added territories on the northern, eastern and southern borders, plus the city of Beirut, to the Mutasarrifiyya of Mount Lebanon. In this case, too, the prior existence of a European military map seems to have created a fact on the ground. ^ a b c Salibi 1990, p. 26: "Since the turn of the century, however, the Maronites had pressed for the extension of this small Lebanese territory to what they argued were its natural and historical boundaries: it would then include the coastal towns of Tripoli, Beirut, Sidon and Tyre and their respective hinterlands, which belonged to the Vilayet of Beirut; and the fertile valley of the Bekaa (the four Kazas, or administrtative districts, of Baalbek, the Bekaa, Rashayya and Hasbayya), which belonged to the Vilayet of Damascus. According to the Maronite argument, this 'Greater Lebanon' had always had a special social and historical character, different from that of its surroundings, which made it necessary and indeed imperative for France to help establish it as an independent state. While France had strong sympathies for the Maronites, the French government did not support their demands without reserve. In Mount Lebanon, the Maronites had formed a clear majority of the population. In a 'Greater Lebanon', they were bound to be outnumbered by the Muslims of the coastal towns and their hinterlands, and by those of the Bekaa valley; and all the Christian communities together, in a 'Greater Lebanon', could at best amount to a bare majority. The Maronites, however, were insistent in their demands. Their secular and clerical leaders had pressed for them during the war years among the Allied powers, not excluding the United States." ^ Salibi 2003, p. 33, "At the battle of the Maysalun Pass, in the Anti-Lebanon, the French did crush the forces of King Faysal in July 1920, which finally opened the way for their occupation of Damascus. Maronite volunteers reportedly fought with the French in the battle, and there were open Maronite celebrations of the French victory, or rather of the Arab defeat. This was not to be forgotten in Damascus." ^ a b Peter Mansfield (1991). A History of the Middle East. p. 202. Harris, William (2012). Lebanon: A History, 600-2011. Oxford University Press. pp. 173–179. ISBN 9780195181111.